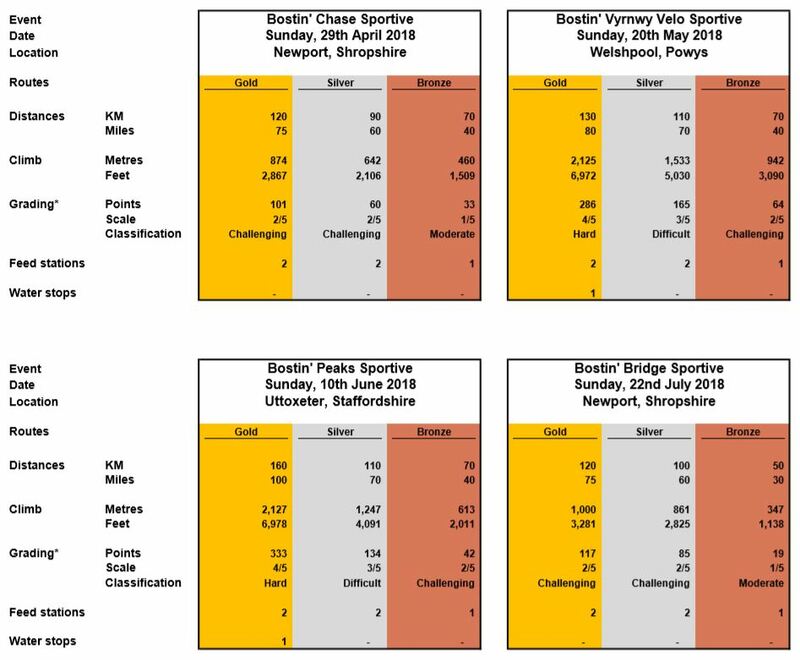 Compare Cycle Sportive Events | Bostin' Ride Cycling Events Online booking for our 2019 events are now OPEN! Enter online now! We would love everyone to take up our Bostin' Series discount and ride all four events we have on offer this year however, we appreciate that that may not be possible. So, if you cannot ride all four events ... which one(s) do you choose? We've detailed below, in table format, the most salient details of each event side-by-side so that you can compare the events using whatever data is important to you. If you need any further help, then feel free to drop us a line. Grade 1 routes are great if you are new to cycling as these routes are usually shorter and flatter. If you are new to cycling but want a challenge, Grade 2 routes will offer a rolling route with some challenging aspects. If you are a regular cyclist and looking for a challenging event that won’t break the legs a Grade 3 is the event for you. Usually around 3000-4000 ft of climbing over a middle distance route. Grade 4 events are for regular, experienced cyclists. Typically routes of a longer distance with challenging climbs included. Training for Grade 4 events is recommended. Grade 5 routes are not for the faint hearted. They will include very hard climbs, usually over a longer distance. It is recommended to train for events such as these to ensure you are fully prepared. Only a handful of events will have a Grade 5.